Modular multi-function vacuum generators are true independent vacuum units that offer an entire vacuum control system. They feature a reduced thickness and weight compared to their suction capacity and they have been designed to be assembled with screws to one or more intermediate modules MI. 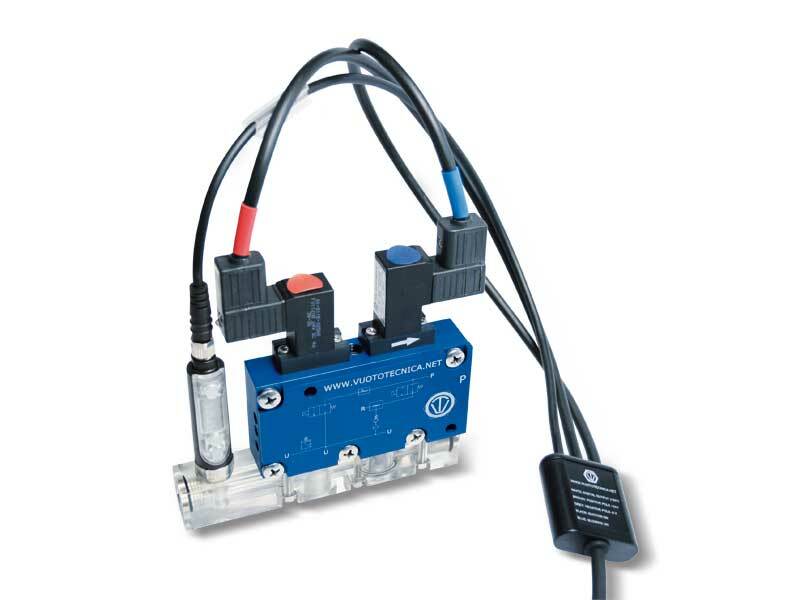 The original internal connection system for the compressed air supply allows communication with no need for external manifolds. 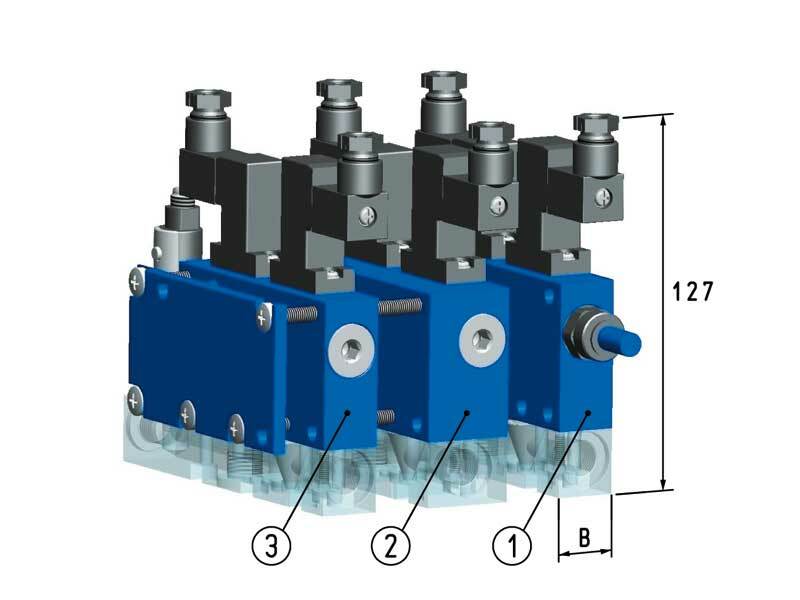 This modular system allows increasing the number of independent vacuum units according to the requirements. In fact, you can order a multi-function vacuum generator and the intermediate modules with the desired capacities, already assembled, or you can assemble one or more intermediate modules to the GVMM generator that has already been installed on the machine, without having to make particular modifications. GVMM vacuum generators are composed of an anodised aluminium mono-block with lid, inside of which the silenced multiple ejectors are installed and the vacuum chamber and the compressed air supply connection are contained. 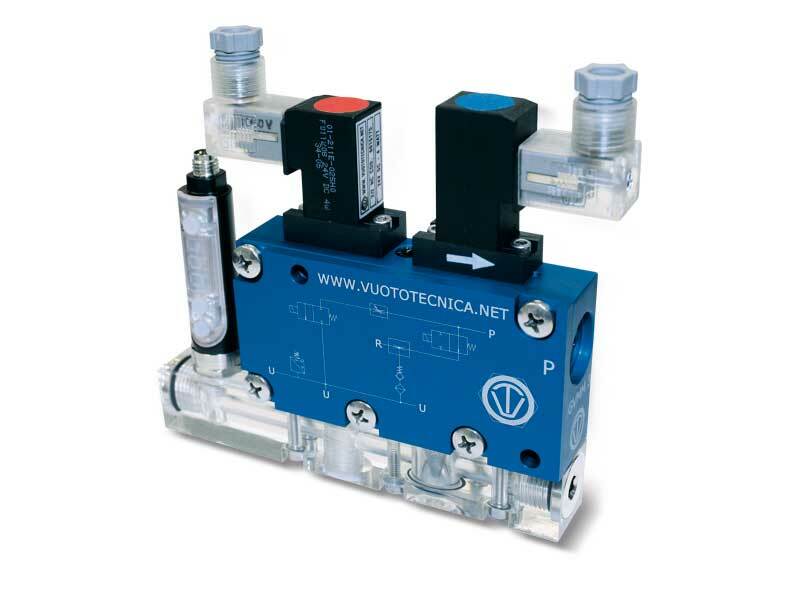 - A micro solenoid valve for supplying compressed air to the generator. 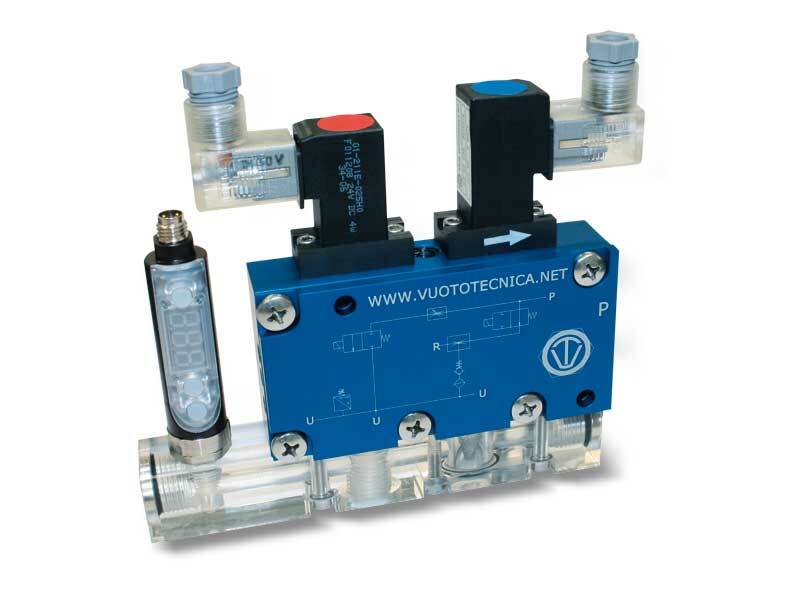 - A micro solenoid valve for blowing the exhaust compressed air. 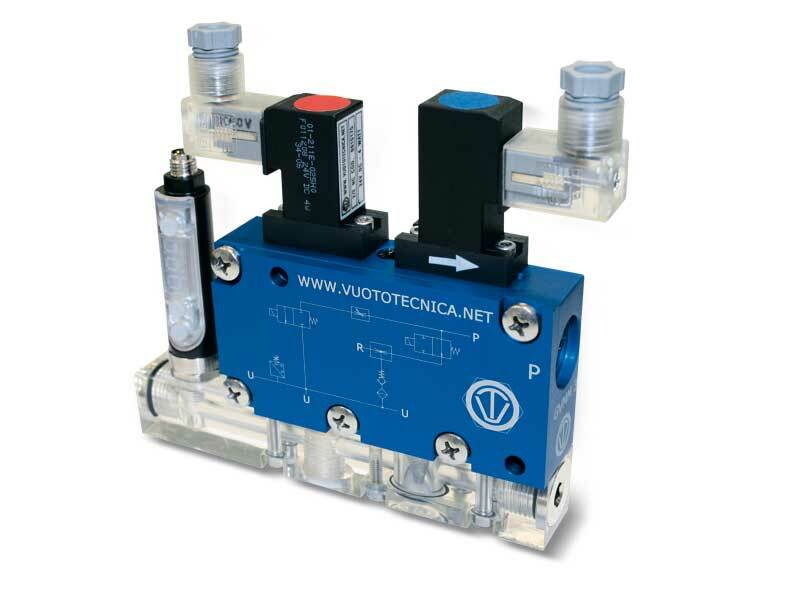 - An adjustable flow regulator for dosing the exhaust air. - A digital vacuum switch with display and commutation LEDs for managing the compressed air supply and for signalling the safety cycle start-up. 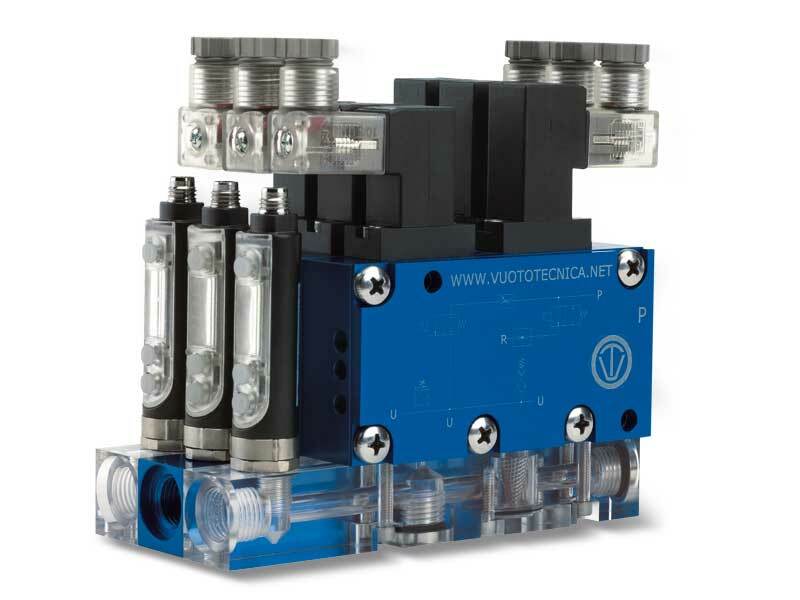 - An anodised aluminium or transparent plexiglass manifold provided with vacuum connections with built-in suction filter, easy to inspect, and a check valve for maintaining the vacuum in case of electricity or compressed air failure. By activating the compressed air solenoid valve, the generator creates vacuum at the service. Once the preset maximum value is reached, the vacuum switch acts on the solenoid valve electric coil and interrupts the air supply, restoring it when the vacuum value returns below the minimum value. Along with maintaining the vacuum level within preset safety values (hysteresis), this modulation allows saving a considerable amount of compressed air. A second vacuum switch signal, also adjustable and independent from the first, can be used to start up the cycle when the vacuum level is suitable for the application. Once the working cycle is completed, the compressed air supply is deactivated and, at the same time, the ejection micro solenoid valve is activated for a quick restoration of the atmospheric pressure at the application. GVMM multi-function vacuum generators can be installed in any position and are suited for interconnecting vacuum gripping systems for handling sheet steel, glass, marble, ceramic, plastic, cardboard, wood, etc., and, in particular, for the industrial robotics sector which requires equipment with excellent performance and several independent vacuum units for controlling several applications but with reduced size and weight. Intermediate modules are non-independent multi-stage and multi-function vacuum generators to be assembled to the generators of the GVMM range. Their thickness and weight are reduced to the maximum compared to their suction capacity and they have been designed to be enclosed between the lid and the base of the GVMM vacuum generator and fixed with screws. The internal connections for the compressed air supply allow communication between them and the basic generator, with no need for external manifolds. This way, each module becomes an independent vacuum unit that can control an entire vacuum system. They can be ordered in the desired amount and capacity, either already assembled onto the GVMM multi-function vacuum generator, or separately, to be assembled to the GVMM generator previously installed onto the machine. In this case, we suggest ordering a screw kit suitable for the number of modules to be assembled. MI intermediate vacuum modules are made up of the same elements that compose GVMM generators, except for the lid. 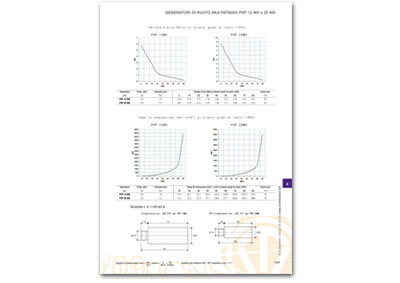 They operate and they are used as the GVMM multi-function vacuum generator onto which they are assembled. GVMM multi-function vacuum generators can be assembled with one or more intermediate modules, thus forming a modular vacuum system, featuring a compact shape and reduced size and weight. As a standard, up to 6 vacuum units can be assembled, but using threaded bars instead allows assembling even more.